Siltech, the Dutch speaker cable specialist, has launched a revolutionary loudspeaker that's designed to work at optimum levels in all kinds of listening rooms. 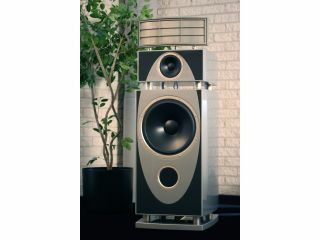 Its new Pantheon - first unveiled in prototype form at The Consumer Electronics Show (CES) in January 2007 - aims to combat the room-induced resonances that plague most hi-fi systems. It does this through the use of what it calls, 'room invariant' design: essentially an 'energy-neutral' cabinet system that is patent pending. Siltech engineers have created the room invariant design with what's known as 'predictive engineering' using Comsol computer design software. The result is a colossal speaker of epic proportions: Pantheon stands at 1.59 metres tall and weighs an incredible 380kg. But be quick, this loudspeaker tour de force is limited to only 39 pairs. The price? 75,000 euros (£53,900).